Injuries to the latissimus dorsi (LD) and teres major (TM) are uncommon problems affecting athletes, specifically those who participate in overhead sports such as baseball. Unfortunately, because these injuries are uncommon, they are often difficult to diagnose and, therefore, are commonly missed, leading to problems with these athletes returning to sport. [1,2] Treatment for these injuries varies and can involve rest and rehabilitation or surgical repair. The LD and TM are strong internal rotators of the humerus and are most active during the late cocking and acceleration phases of the pitching cycle; they also have a small amount of activation during the deceleration phase. [8,9] The LD and TM are important structures in the kinetic chain of pitching, whereby the force generated from the lower extremity and trunk is transferred to the humerus and upper extremity. These muscles play a role in protecting the shoulder from excess shear and manufacturing pitch speed. The LD and TM eccentrically contract at the end of the late cocking phase to decelerate the arm and halt shoulder external rotation, protecting the anterior capsule. The LD and TM concentrically contract during acceleration phase, producing humeral internal rotation. The LD and TM play a role in decelerating the arm in the deceleration/follow-through phase. As a result, tears of the LD and TM in high-level athletes often prevent them from continuing to compete at their normal level without either operative or non-operative treatment. A 23-year-old male professional minor league baseball player presented 1 week after experiencing significant pain in his right posterior shoulder and proximal arm. The pain started after he had thrown a fastball in a game. He felt the pain immediately as he let the ball go, and video of the pitch showed that he grabbed his posterior axillary fold immediately after the pitch. He did not have any pain or discomfort in his shoulder or elbow. He denied any numbness or tingling in his arm or hand. He denied any prior complaints with this arm. He had a history of an ulnar collateral ligament reconstruction (UCLR, commonly known as Tommy John surgery) 3 years prior. He was able to return to sport (RTS) at the same level following his UCLR. Since this recent injury, he had stopped throwing. When he was not throwing, he complained of a dull ache in his posterior axillary fold when reaching for things overhead. Radiographs of the shoulder did not show any osseous abnormalities. MRI of the right shoulder demonstrated a Grade III tear of the LD with an intact TM and approximately 1 cm of retraction (Figure 1). Figure 1. MRI showing a Grade III tear of the latissimus dorsi (white arrows) with an intact teres major and 1 cm of retraction in 23-year-old male professional minor league baseball player. It must be noted that unless the MRI technician is skilled and the radiologist understands the proper protocol to image the LD and TM, the MRI of the shoulder will not typically include the LD and TM. In these cases, the surgeon should order an MRI of the chest wall to ensure the LD and TM are properly visualized. A long discussion with the patient, his family, his agent, and the coaching and training staff ensued. The options presented to the patient included non-operative treatment with rest and return to a throwing program or operative treatment with surgical repair of the torn LD. 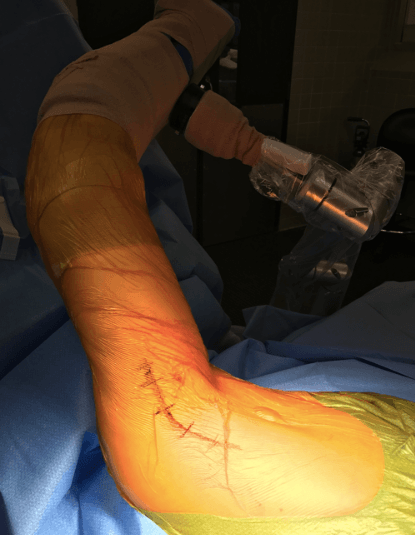 We discussed the nature of the surgery and associated risks, including injury to the radial nerve, potential wound complications, and re-tear, as well as the postoperative recovery and rehabilitation protocol. The patient communicated his understanding of the risks, and after discussion with the patient, coaching/training staff, agent, and family, the decision was made to proceed with surgical repair. The patient was given a nerve block as well as general anesthesia. He was then placed in the lateral decubitus position using a beanbag, left (uninjured) side down, with an axillary roll placed and all bony prominences well padded. Care must be taken to ensure the scapula of the involved side is free, but that the patient is not leaning back, as this can make the case more difficult. An arm positioner (Trimano; Arthrex, Naples, Florida) was attached to the operating room bed across from the patient. The arm positioner must be placed above the arm board for the down arm to allow proper positioning: The surgeon will need to abduct the arm to 90° and maximally internally rotate the arm to expose the LD. An exam under anesthesia demonstrated full ROM of the right shoulder and no evidence of significant anterior or posterior translation. The patient was then prepped and draped in the usual sterile fashion. A curvilinear incision was then made in the region of the posterior axillary fold (Figure 2). This incision is typically 6 to 9 cm long. Figure 2. Proper set-up for surgical repair of the torn LD with the arm positioner across from the patient and the proposed incision. Dissection was carefully taken down to the fascia, avoiding the cutaneous nerves including the posterior brachial cutaneous nerve. Dissection was carried slightly more anterior in the incision, as the LD and TM are in the anterior portion of the incision. It takes time and patience to expose these structures, especially in patients with chronic tears. Once the LD and TM were defined, they were followed to their humeral attachment. These tendons will often appear to be intact even when they have torn off the bone and the body has attempted to heal through a fibrous union. The tissue will feel very different from the healthy tendon stump and should be carefully removed, taking great care to leave all normal tendon to ensure that the LD and TM tendons reach their insertion on the floor of the intertubercular groove of the humerus. The variation in LD/TM tear pattern can be significant, and the surgeon should be prepared for a myriad of tear patterns. In some cases the LD and TM are both torn, while in other cases, the LD is torn in isolation. Occasionally, the TM can be torn in isolation (the authors have seen this in a competitive wake boarder). In this particular case, the TM was intact and the LD was completely torn off the humerus. Figure 3. Intraoperative image showing the LD (held in the Alice clamp) after it was dissected free and mobilized out of the incision. Once the tear pattern was defined and the tendon stumps were cleaned, the humerus was exposed. The radial nerve runs in the anterior aspect of the incision, crossing the path of the LD. Care should be taken to visualize and protect this nerve throughout the case, but specifically at this point to avoid damage when placing retractors around the humerus. A blunt Homan was placed anteriorly and a pointed Homan was placed posteriorly around the humerus. An army navy or thyroid retractor can be placed to help retract tissues as well. A bump can sometimes be felt where the LD inserts, just medial to the bicipital groove, at a similar level to the pectoralis major insertion. At the LD/TM insertion, the tendons turn approximately 90°. This orientation should be reproduced with the repair. The tendon stump was cleaned off the humerus and the area was copiously irrigated. The biceps tendon was retraced out of its groove to prevent damage to the biceps tendon. The humeral insertion was prepped using a high-speed burr and rasp, taking care to protect the radial nerve. Once the humeral insertion was decorticated to a bleeding surface, 3 proximal pec buttons were placed prior to tendon repair. The authors prefer to use a pec repair button kit (Arthrex, Naples, Florida) that includes 3 buttons that can be loaded with high-tensile suture. Other surgeons may prefer 2 or 3 proximal buttons or suture anchors to repair the tendon. The buttons were placed in a stoplight configuration, approximately 8 to 10 mm apart, avoiding convergence of the holes of these fixation devices. Figure 4. Intraoperative image showing the 3 proximal pec buttons loaded with high-tensile sutures placed in a stop light configuration at the insertion of the LD on the humerus. Sutures from each button were used with the Krackow suture technique, with one end up and down the tendon. (Note that the suturing pattern will depend on the tear pattern.) A simple suture was placed through the tendon using the corresponding end. The end that had only 1 throw through the tendon was marked with a marking pen to be used as the post then tying the sutures later. This process was repeated for all sutures. Once all sutures were passed, all post sutures were sequentially pulled up but were not yet tied down. They were pulled up at this point to take all the slack out of the system. Then, once all the slack was out of the system, they were tied down sequentially. This brought the tendon stump back to the humerus. After copious irrigation, the incision was closed in a layered fashion with Monocryl on the skin followed by Dermabond, as the incision is in an at-risk area. A silver-impregnated dressing can be used if the surgeon choose. A sling was placed on the patient and he was taken to the recovery room. The goal of the first 6 weeks is to let the tendon heal down to bone. Below is the postoperative protocol the authors have found to be effective. Athletes should understand that they will need 9 to 12 month for recovery before they can perform at their optimal level. Some athletes may progress faster and others may be slower, but this is the general guideline. Proper positioning is critical to this case. If the arm cannot be brought into the proper position, the repair will be difficult. Attention to detail is imperative during the positioning phase of the case. Dissecting out the LD and TM tendons and defining the tear pattern can be challenging, especially in chronic cases. Blunt finger dissection and gently spreading will help define these tendons. This is one of the most difficult parts of the operation and should be performed in a meticulous manner. The LD and TM tendons rotate as they insert onto the humerus. This rotation should be recreated with the repair construct to ensure proper function. 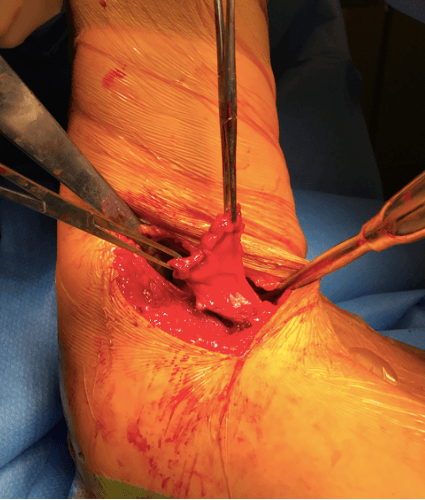 Sequentially taking the slack out of the sutures that have been passed through the LD and TM tendons before tying any of them will help bring the tendons back the humerus and will minimize stress on each set of sutures as they are tied. Failure to do this can lead to 1 set of sutures being looser than the others. Tears of the LD and TM tendons are uncommon injuries that are often difficult to diagnose. [14,15] The injury is typically a traumatic injury, in which an athlete feels a pull in their posterior axillary fold following an overhead baseball pitch, or with eccentric contraction of the LD and TM. Although many of these injuries can be treated conservatively, tears of the LD/TM that have completely torn off the humerus and have some degree of retraction are less likely to heal in a reliable fashion, and surgical repair should be considered. These injuries often occur in high-level athletes, so a discussion with the coaching staff, training staff, player, agent, and parents must take place to ensure everyone is on the same page with regard to the treatment strategy. In this case, the pitcher who injured himself knew right away that he had done something to his arm and did not want to attempt non-surgical treatment. The number of studies reporting outcomes of non-operative and operative treatment of LD and TM tears is extremely limited. Schickendantz et al  reported on the non-operative management of 10 Major League Baseball players who sustained an injury to their LD and TM. Only 1 player was unable to RTS at the same level as before injury in the same season that the injury occurred (9 of the 10 players RTS at 3 months). One player suffered a recurrence at 6 months after RTS and was successfully treated non-operatively the second time. Nagda et al  evaluated 16 professional baseball pitchers with LD and TM tears that were managed non-operatively and found 94% were able to RTS at the same or higher level. Erickson et al  found a similar time to RTS: The average time to throwing was 35.6 days, average time to pitching was 61.9 days, and average time lost for athletes who were able to RTS the same season was 82.4 days. Two players in this study sustained a recurrent injury. Importantly, the authors found complete disruptions of the LD was associated with poorer results with regard to RTS. There are no data about the use of biologics, such as platelet rich plasma or bone marrow aspirate concentrate, in patients who sustain an LD/TM tear, and, therefore, biologics are not typically offered by the authors as a treatment option. Based on the results of these studies, it appears that patients who have strains or partial-thickness tears of the LD and TM tendons should be initially managed non-operatively, while those with full-thickness tears, especially those with evidence of more than 2 cm of retraction, should undergo operative repair. Further work is needed to develop a treatment algorithm for patients with LD and TM injuries to ensure they receive the highest-quality, evidence-based care. Brandon J. Erickson, MD, is an orthopaedic sports medicine and shoulder surgeon at The Rothman Institute, New York, New York. Anthony A. Romeo is an orthopaedic shoulder, elbow, and sports surgeon and chief of orthopaedics at The Rothman Institute, New York, New York. Dr. Romeo is also the president of the American Shoulder and Elbow Surgeons (ASES). Mehdi SK, Frangiamore SJ, Schickendantz MS. Latissimus Dorsi and Teres Major Injuries in Major League Baseball Pitchers: A Systematic Review. Am J Orthop (Belle Mead NJ). 2016;45(3):163-167. Nagda SH, Cohen SB, Noonan TJ, Raasch WG, Ciccotti MG, Yocum LA. Management and outcomes of latissimus dorsi and teres major injuries in professional baseball pitchers. Am J Sports Med. 2011;39(10):2181-2186. Pearle AD, Voos JE, Kelly BT, Chehab EL, Warren RF. Surgical technique and anatomic study of latissimus dorsi and teres major transfers. Surgical technique. J Bone Joint Surg Am. 2007;89 Suppl 2 Pt.2:284-296. Pouliart N, Gagey O. Significance of the latissimus dorsi for shoulder instability. I. Variations in its anatomy around the humerus and scapula. Clin Anat. 2005;18(7):493-499. Beck PA, Hoffer MM. Latissimus dorsi and teres major tendons: separate or conjoint tendons? J Pediatr Orthop. 1989;9(3):308-309. Lim JK, Tilford ME, Hamersly SF, Sallay PI. Surgical repair of an acute latissimus dorsi tendon avulsion using suture anchors through a single incision. Am J Sports Med. 2006;34(8):1351-1355. Pearle AD, Kelly BT, Voos JE, Chehab EL, Warren RF. Surgical technique and anatomic study of latissimus dorsi and teres major transfers. J Bone Joint Surg Am. 2006;88(7):1524-1531. Jobe FW, Tibone JE, Perry J, Moynes D. An EMG analysis of the shoulder in throwing and pitching. A preliminary report. Am J Sports Med. 1983;11(1):3-5. Schickendantz MS, Kaar SG, Meister K, Lund P, Beverley L. Latissimus dorsi and teres major tears in professional baseball pitchers: a case series. Am J Sports Med. 2009;37(10):2016-2020. Hapa O, Wijdicks CA, LaPrade RF, Braman JP. Out of the ring and into a sling: acute latissimus dorsi avulsion in a professional wrestler: a case report and review of the literature. Knee Surg Sports Traumatol Arthrosc. 2008;16(12):1146-1150. Hiemstra LA, Butterwick D, Cooke M, Walker RE. Surgical management of latissimus dorsi rupture in a steer wrestler. Clin J Sport Med. 2007;17(4):316-318. Leland JM, Ciccotti MG, Cohen SB, Zoga AC, Frederick RJ. Teres major injuries in two professional baseball pitchers. J Shoulder Elbow Surg. 2009;18(6):e1-5. Park JY, Lhee SH, Keum JS. Rupture of latissimus dorsi muscle in a tennis player. Orthopedics. 2008;31(10). Donohue BF, Lubitz MG, Kremchek TE. Sports Injuries to the Latissimus Dorsi and Teres Major. Am J Sports Med. 2017;45(10):2428-2435. Erickson BJ, Chalmers PN, Waterman BR, Griffin JW, Romeo AA. Performance and return to sport in elite baseball players and recreational athletes following repair of the latissimus dorsi and teres major. J Shoulder Elbow Surg. 2017. Cox EM, McKay SD, Wolf BR. Subacute repair of latissimus dorsi tendon avulsion in the recreational athlete: two-year outcomes of 2 cases. J Shoulder Elbow Surg. 2010;19(6):e16-19. Ellman MB, Yanke A, Juhan T, et al. 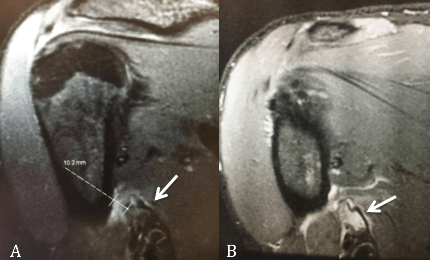 Open repair of an acute latissimus tendon avulsion in a Major League Baseball pitcher. J Shoulder Elbow Surg. 2013;22(7):e19-23. Gregory JM HD, Sherman SL, Romeo AA. 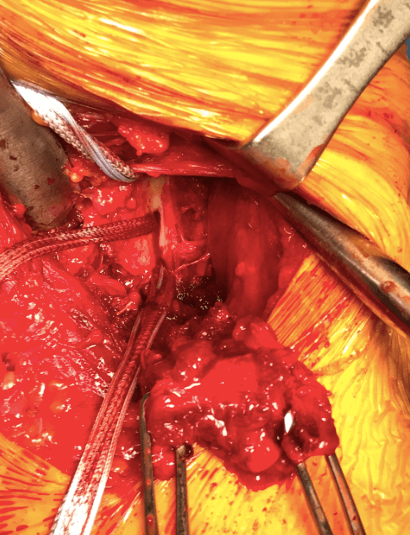 Surgical repair of a subacute latissimus dorsi tendon rupture. Techniques in Shoulder and Elbow Surgery. 2011;12(4):77-79.